A senior official of the United Arab Emirates appears to advocate for closer ties to Israel, saying that Arab world’s decades-old decision to boycott the Jewish state was a mistake. “Many, many years ago, when there was an Arab decision not to have contact with Israel, that was a very, very wrong decision, looking back,” Emirati Minister of State for Foreign Affairs Anwar Gargash tells the UAE-based The National newspaper in an interview. Gargash says a “strategic shift” was needed for progress in the Israeli-Palestinian peace process, noting that in 15-20 years a two-state solution will have become impractical, and a unitary state where Jews and Arabs have equal rights will be the only realistic possibility. BERLIN — German hardrock band Rammstein has sparked protests from politicians, historians and Jewish groups with a video showing band members dressed as concentration camp prisoners with nooses around their necks. Critics accuse the Berlin-based group of a cynical publicity stunt playing with Nazi-era imagery to generate media hype and online clicks for their new single. However, in the new promotional clip, the band members are dressed in black-and-white striped concentration camp garb and seemingly awaiting their execution by hanging. Lindemann is shown bleeding from a facial cut and guitarist Paul Landers, 54, wears a Star of David. At the end of the 35-second clip, the song title “Deutschland” (Germany) appears in Gothic letters. WASHINGTON — US President Donald Trump announces Thursday that the FBI and Justice Department will review Illinois prosecutors’ decision to drop all charges against a US television actor accused of fabricating a hate crime. Prosecutors said they had shelved all 16 felony charges against Smollett in exchange for an agreement that he carry out community service and forfeit a $10,000 bond payment. 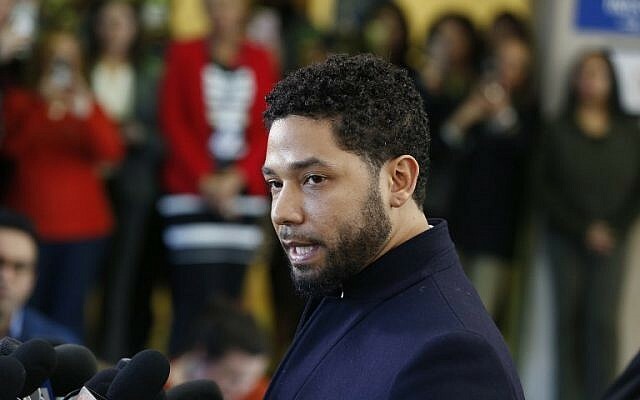 But Smollett’s lawyers claimed there was no such agreement, saying the state simply “dismissed the charges,” and that the actor was the victim of a rush to judgment. The 36-year-old, one of the main cast members on Fox musical drama “Empire” alongside Taraji P. Henson, was accused of masterminding a hoax attack in downtown Chicago to gain publicity and secure a bigger paycheck. A suspicious balloon apparently flown from the Gaza Strip is found in a field near a farming community in southern Israel, according to the Sha’ar Hanegev Regional Council. A Border Police officer was lightly injured in a suspected car-ramming at the Qalandiya checkpoint outside Jerusalem, according to police. Police say the driver of the vehicle managed to flee the scene. The Magen David Adom ambulance service says its medics are treating a “pedestrian” near Qalandiya with injuries to his head and limbs. The dovish lobby group J Street condemns Prime Minister Benjamin Netanyahu for sharing a video of him “humiliating” former US president Barack Obama. “Netanyahu apparently decided to destroy the remaining support his government has in the Democratic Party. Instead of thanking President Obama for signing the largest ever [military] aid package for Israel, Netanyahu takes prides in the lack of respect he showed Obama,” Yael Patir, the head of J Street Israel, says in a statement. “This video is unnecessary and even more severely is devastating to bipartisan American support for Israel,” adds Patir, whose group was a vocal supporter of the Obama administration. The video clip, which was taken from the PBS documentary “Netanyahu at War,” shows footage from the contentious 2011 Oval Office meeting between Obama and Netanyahu, with the narrator saying the prime minister “lectured” the US president on the Israeli-Palestinian peace process. An Israeli drone shot at a group of Palestinians launching balloon-borne incendiary devices into Israel from the northern Gaza Strip, injuring four of them, the army confirms. 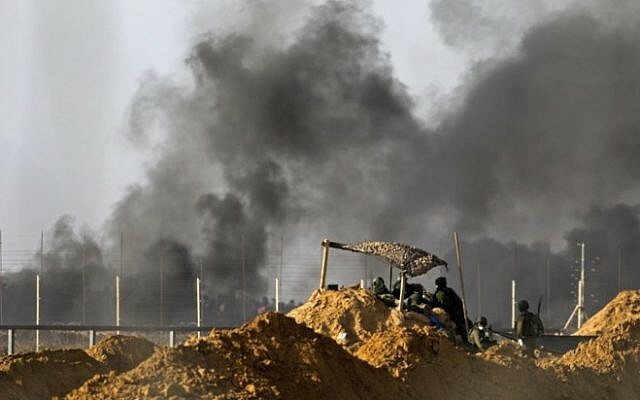 A number of airborne arson and explosive devices have landed in Israeli fields around the Gaza Strip throughout the day. 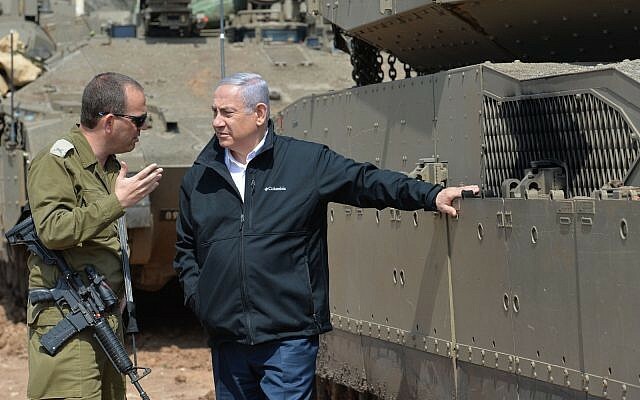 Prime Minister Benjamin Netanyahu says he has instructed the army to be ready for a “wide-scale campaign” in the Gaza Strip ahead of major clashes expected over the weekend. “We’re tightening the security ring around the Gaza Strip,” he says at an event in northern Israel after visiting troops on the Gaza border. “Citizens of Israel should know that if we must we’ll enter [Gaza] strong and confident, after we’ve exhausted all the other possibilities,” adds Netanyahu, who is also defense minister. The comments come as the army prepares for large riots along the security fence over the weekend as Palestinians mark one year since the start of the “March of Return” protests and after Israel and Palestinian terror groups in Gaza engaged in intense fighting earlier in the week. Netanyahu also addresses tensions on the northern border in the wake of a strike attributed to Israel in Syria on targets linked to Iran. “Iran is constantly trying to bring very advanced and very deadly long-range precision missiles into Syria. We’re not prepared to accept this and our operations against Iran’s military entrenchment efforts in Syria — to introduce advanced weaponry — continue all the time,” he says. Egyptian mediators are heading to Israel to discuss a potential ceasefire plan with Hamas to end hostilities in the Gaza Strip that began earlier this week. Three Hamas officials familiar with the negotiations say that the Egyptians offered Hamas a series of measures to ease the Egyptian-Israeli blockade on Gaza. In exchange, Hamas would have to pledge to halt rocket fire and keep protests along the Israeli border under control. The officials say the deal would only take effect after a planned mass demonstration along the Israeli border. They speak on condition of anonymity because the negotiations were ongoing. One of the officials describes the atmosphere as positive. Another official says the Egyptians were discussing the proposal with Israel this afternoon. There is no immediate Israeli comment. Thousands of Palestinians have gathered at least weekly along the border in protests that have led to deadly clashes with the Israeli military. Around 40 children have been killed in the protests and “nearly 3,000 others have been hospitalized with injuries, many leading to life-long disabilities,” the UN children’s agency (UNICEF) says. “UNICEF reiterates its outrage at the very high numbers of children who have been killed and injured as a result of armed conflict 2018,” says UNICEF’s Middle East director Geert Cappelaere. Israel says its response is necessary to defend the border and accuses Hamas, with whom it has fought three wars, of orchestrating violence there. A mass border protest planned for Saturday to mark the first anniversary of the demonstrations has raised fears of further tensions. The Israeli military says it is readying itself for the protests along the Gaza border planned for Saturday, Palestinians’ Land Day, and the outbreak of violence that is feared to coincide with them. “IDF troops have completed operational preparations for the events of Land Day in the southern region and are continuing to increase preparedness for a possible escalation of violence caused by violent and terrorist acts during [the protests],” the army says in a statement. Ahead of the protests and riots expected for Saturday, the Israel Defense Forces deployed three additional brigades to the Gaza Division, along with an artillery battalion, and called up reservists from air defense and other select units. The military has also canceled weekend leave for all combat soldiers stationed in the Southern Command. “The troops are receiving briefings and conducting preparedness checks and exercises simulating potential scenarios,” the military says. Throughout the day IDF chief Aviv Kohavi has been “holding situational assessments, discussions of possible scenarios and approving operational plans,” the army says. Kohavi also ordered that all preparations be completed by tomorrow. Brazilian President Jair Bolsonaro walks back his promise to move Brazil’s embassy in Israel to Jerusalem. Bolsonaro tells reporters he is instead considering opening a “business office” in the city, according to Reuters. 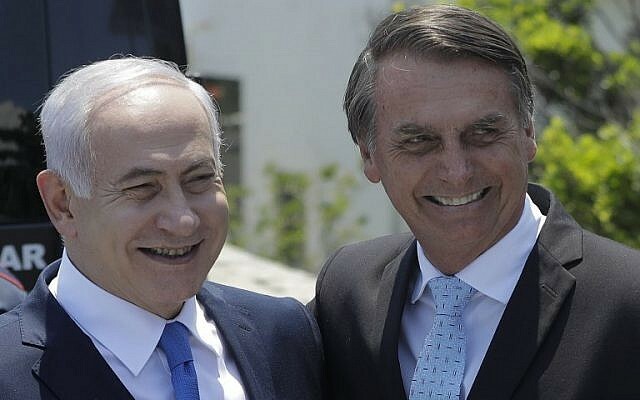 The reversal comes ahead of the far-right Brazilian leader’s planned visit to Israel next week. Bolsonaro promised to move Brazil’s embassy to Jerusalem while campaigning last year and just days after his election said it was not a matter of if but when. His administration has since softened its stance over concerns the move could damage Brazil’s ties with Muslim states and harm exports of halal meat. 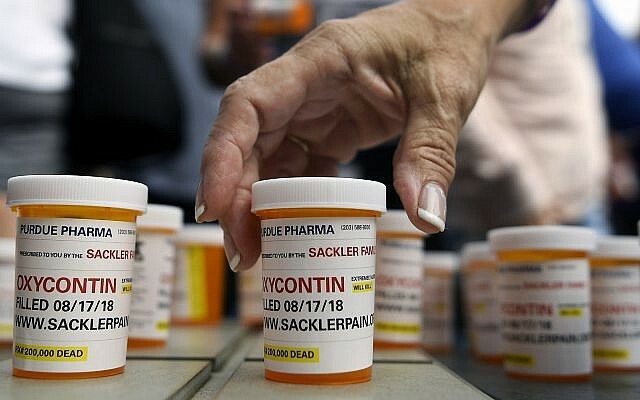 NEW YORK — New York on Thursday sues the billionaire family behind OxyContin, joining a growing list of state and local governments alleging the drugmaker sparked the nation’s opioid crisis by putting hunger for profits over patient safety. The state, which averages nine opioid-related deaths per day, amends an existing lawsuit against pill maker Purdue Pharma to add members of its controlling Sackler family as defendants. The state also adds as defendants five other companies that produce opioid painkillers and, in what New York Attorney General Letitia James called a novelty, four drug distributors. “This is an extensive lawsuit that leaves no stone unturned,” James, a Democrat, says at a news conference. The lawsuit seeks penalties and damages that could add up to tens of millions of dollars and a dedicated fund to curb the opioid epidemic. It also seeks to have the companies stripped of their licenses and barred from marketing and distributing painkillers in New York until they abide by strict safeguards. The announcement of New York’s expanded lawsuit came two days after Purdue and the Sacklers, who are Jewish, agreed to pay $270 million to the state of Oklahoma. It was the first settlement in a recent wave of nearly 2,000 lawsuits that the company says could push it into bankruptcy. In settling the case, Purdue denied any wrongdoing. A television poll puts the ruling Likud Party in a dead heat with the Blue and White faction at 30 Knesset seats apiece, less than two weeks ahead of national election on April 9. Blue and White, an alliance of ex-military chief Benny Gantz’s Israel Resilience and Yair Lapid’s centrist Yesh Atid party, has seen its lead over Likud in polls gradually slip since its formation last month. Following Blue and White and Likud in the Channel 13 survey was the opposition Labor Party with 10 seats; the Union of Right-Wing Parties, United Torah Judaism, Zehut and Hadash-Ta’al with seven seats each; the New Right and Meretz with five seats; and Kulanu, Shas and Ra’am-Balad bringing up the rear with four seats apiece. Asked who was better suited to be prime minister, 51 percent of poll respondents say incumbent Benjamin Netanyahu, versus 36% who picked Gantz. Egyptian mediators have returned to the Gaza Strip as they continue efforts to broker a ceasefire between Israel and the Palestinian enclave’s Hamas rulers, according to local reports. The Egyptian-mediated truce negotiations come ahead of expected heavy clashes over the weekend on the Gaza border, as residents of the Strip mark the anniversary of the March of Return protests and on the heels of fighting earlier in the week between Israel and Palestinian terror groups. 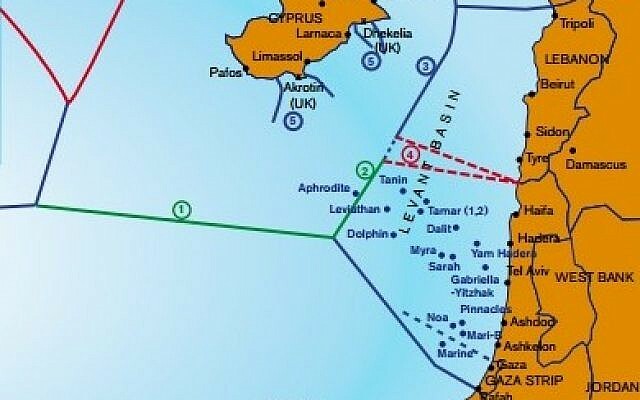 A group of Palestinians in the Gaza Strip damage the security fence separating the coastal enclave from Israel, according to Hebrew media reports. Channel 13 says the Palestinians fled after Israeli troops fired warning shots. 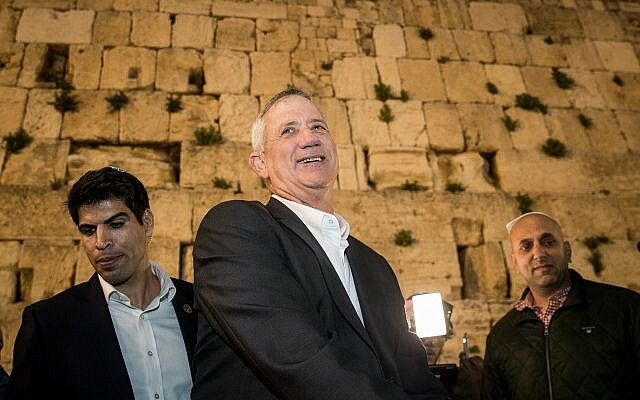 Blue and White party leader Benny Gantz was accompanied on a visit to Jerusalem today by a bodyguard following threats against the former military chief of staff on social media. 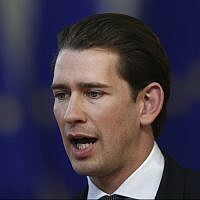 The development comes after Channel 12 news earlier this week quoted unnamed associates of Gantz warning of “grave incitement” against the prime ministerial hopeful on social media. 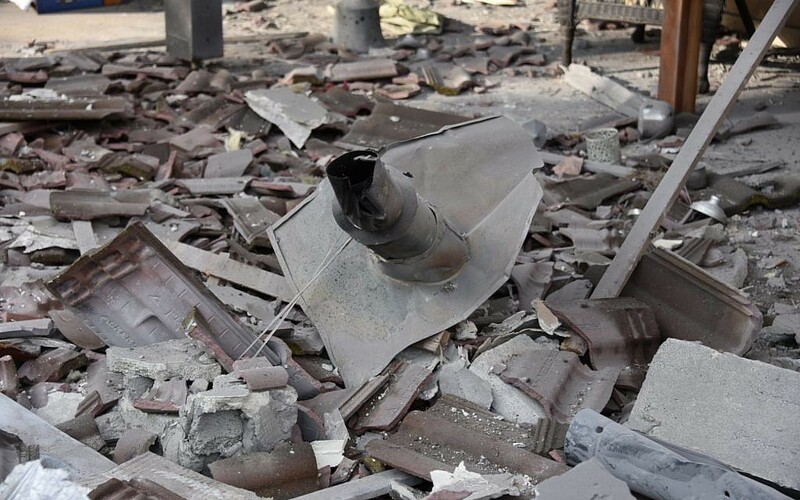 A senior member of Hamas’ military wing says rockets recently fired from the Gaza Strip toward central Israel launched on their own due to the terror group’s heightened war footing. 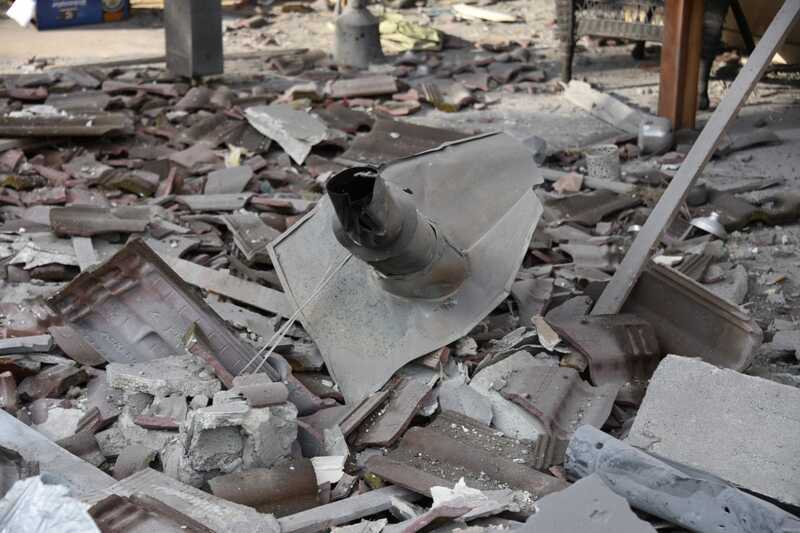 “The early, automatic activation of the rockets from Gaza was the result of a decision of the resistance’s leadership to heighten its fighting preparedness,” the unnamed Izz ad-Din al-Qassam Brigades official tells Al-Jazeera. “We decided to bolster our fighting preparedness after the occupation’s determination to carry out a hostile act before the elections came to light,” the official adds. A spokesperson for the southern Israeli Eshkol region denies a report on the Kan news broadcaster claiming residents of Kibbutz Kerem Shalom were asked to leave their homes out of concerns over violence along the border nearby expected for this weekend. According to the official, residents of Kerem Shalom — one of the Israeli communities closest to the Gaza border — had been offered a free weekend away by the Eshkol Regional Council, but not out of fears regarding this upcoming weekend, rather because of the events of last weekend, when especially loud night-time riots kept some residents from sleeping. Hardly any Kerem Shalom residents accepted the offer for the weekend getaway, the Eshkol spokesperson says. Night-time “confusion units” return to the Gaza border, setting off large explosive devices along the security fence, which can be heard throughout the nearby Israeli communities. On a nightly basis, these groups have staged riots along the border aimed at both disturbing the Israeli civilians living near the Strip and distracting Israeli troops stationed along the border. A video from the Israeli side of the border shows the moment when one of these explosives is detonated, triggering a massive fireball and large bang. An East Jerusalem man was arrested on suspicion of striking a Border Police officer with his car at the Qalandiya checkpoint near Jerusalem, police said. The suspect was turned over for questioning following his arrest. Police early said the incident appeared to be criminal and not nationalistic – the term generally used for Palestinian terrorism.